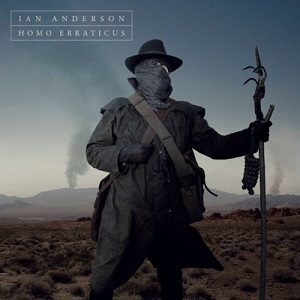 Homo Erraticus is the new solo album from Ian Anderson. Of course given that the musicians involved are all former Jethro Tull members then you could equally look on this as a new Jethro Tull album. Whichever way you look at it though, you've got an album by Ian Anderson with his vocals and flute playing alongside a band - so very little difference to Jethro Tull. Listening to the album then it's clear that most Jethro Tull fans are likely to enjoy this - Ian Anderson hasnt decided to do something radically different to Tull just because its a solo album. In fact many fans are likely to see this album as a return to form as his recent solo albums haven't necessarily lived up to the hopes of Jethro Tull fans. Slightly bizarrely from a man who says he wants to use his own name now (instead of that of an 18th century agriculturalist) he's using a different pseudonym on the album as he credits the writing to Gerald Bostock, the fictional character he has used before. The album tells the complete history of Britain. That's not an easy task in a large heavy book, but Ian Anderson does it here in the space of fifteen songs, right from when Britain was first settled by people crossing the Doggerland (an area of land that connected Britain to Europe but which is now under the North Sea), right up to the present day. Obviously he's not related every event that formed Britain - instead he's picked out certain events or topics over time to illustrate in song, so you've got the arrival of people in Britain, metal from early smiths to modern manufacturing, new arrivals - from the Romans and Vikings to the arrival of American TV and internet sites, Railways, and more. Ian Anderson writes highly intelligent lyrics that tell interesting stories and form songs that you're keen to listen to carefully so you don't miss the details. So it's fair to say that these are excellent songs that are superbly written. Add in his distinctive vocals and flute playing and you've got a great album. I'm not going to pick out individual tracks to praise - with this album that would be like picking out certain pages or chapters from a book. This is an album that is definitely best enjoyed as a whole. An excellent album that really is well worth a listen.